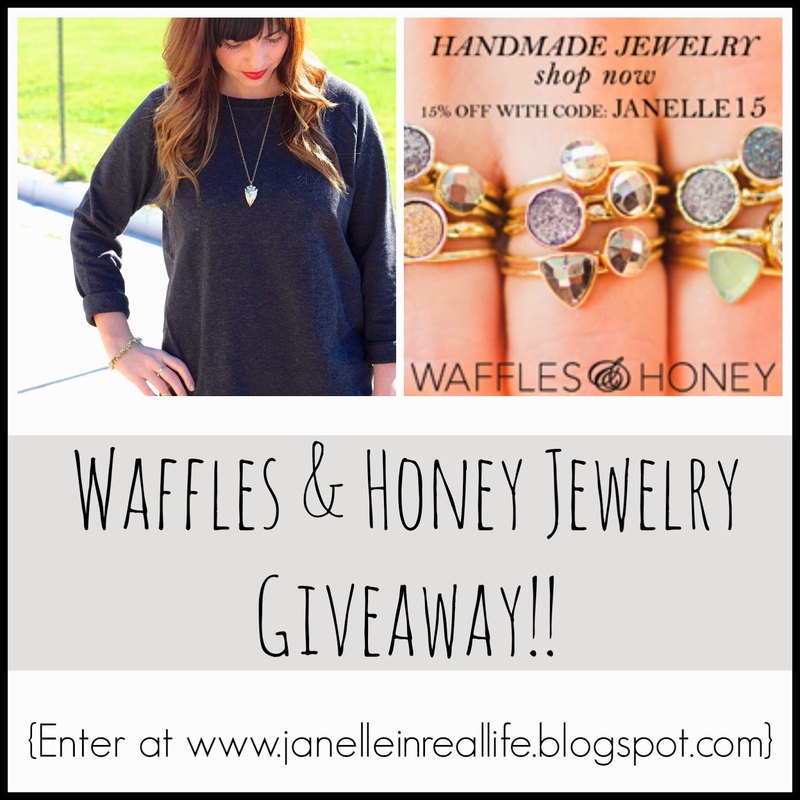 Janelle In Real Life: Waffles & Honey Jewelry GIVEAWAY! Waffles & Honey Jewelry GIVEAWAY! Hey friends! Happy, happy Monday. I super loved the long weekend my hubby got to spend with us... we had all kinds of fun and did plenty of relaxing. I did a little small business shopping on Saturday but I didn't really do the black Friday thing this year (except we got a vacuum from Target... we are officially boring adults). I've seriously worn it so many times (and in fact I have ANOTHER outfit that I wore it with to show you this week). Well that pretty thing is up for grabs! Waffles & Honey Jewelry is partnering with me to giveaway this beautiful 14k gold arrowhead necklace! And here's the thing... if you see any other beautiful items from their shop that you're loving, you can use the code Janelle15 at checkout to get 15% off! Perfect for yourself OR as a Christmas gift! And remember, you're supporting an amazing small business who makes high quality, very on trend jewelry. Karina (the jewelry designer) is so sweet and talented and she would love to help you find the perfect piece for yourself or someone else. Click HERE to head to their shop! Enter the giveaway below with rafflecopter! i love the sharktooth necklace! Loving anything indian inspired right now! That necklace is adorable! Dear me! those look awesome! Cute outfit!!! Love your lipstick. The clover necklaces are all so cute! So cute on you! and I totally agree- you can get some amazing, unique pieces when you shop from small businesses! It's the way to go! Love the midnight druzy ring! My favorite piece is the Midnight Druzy stacking ring! I love the Sapphire Drop Earrings! I like the wishbone necklace. The starfish necklace is too cute! I love the amazing emerald drop earrings! I love the necklace and I think supporting small businesses is such a great thing to do! Thanks for linking up with us! Oh my gosh I love all their stuff! My favorite piece is the set of triangle stacking rings! Thanks for the great giveaway! I love the Gold Arrowhead Necklace, what a beautiful piece! I'm excited about this giveaway -- fingers crossed! First, I just love, love, love the name "Waffles & Honey!" It's great!! My fave piece would have to be the shark tooth necklace. 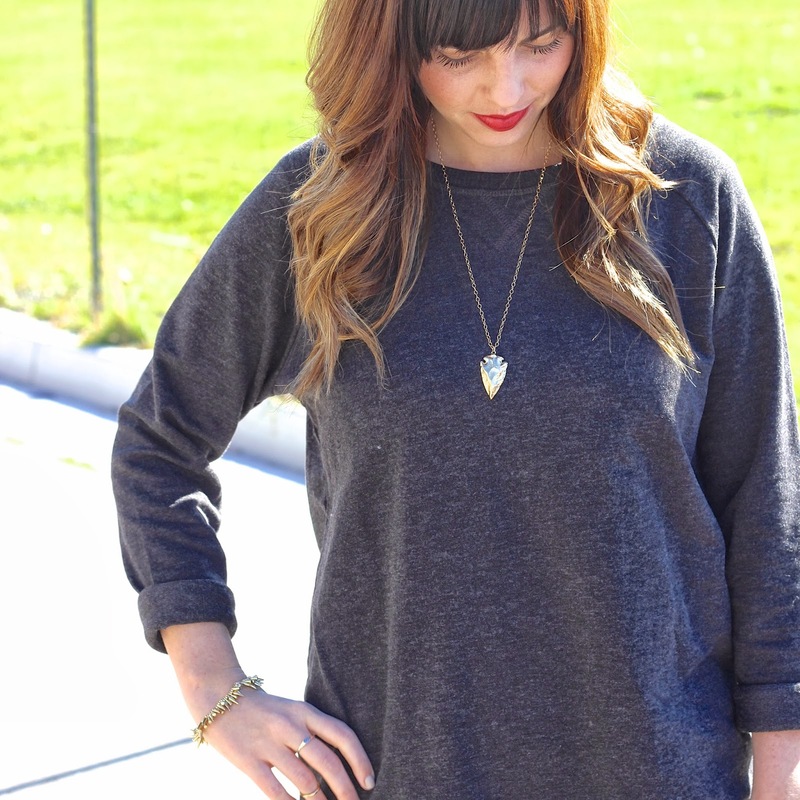 The arrowhead necklace looks great on you - perfect length. I would love it if you shared your look and giveaway on my Love Your Look Link Up!! Thanks!! Chalcedony Drop Earrings are super awesome and would love to have any of this jewelry! It's so very ME! HA! Thanks a bunch! I love the Diamond Amethyst Necklace. Great giveaway, come check mine out as well! Wow, that necklace is just gorgeous! Such a cute necklace and I am loving those rings pictured. Thanks for sharing your look with Three-fer Thursday! PS You have word verification turned on. I need the gold Arrowhead necklace in my life! it is to die for! I love the gold sun necklace! LOVE the Amethyst Slice Necklace!!!! Yea, I am a simple girl and those hammered gold hoop earrings are calling my name. I love the sapphire drop necklace - what a gorgeous blue!